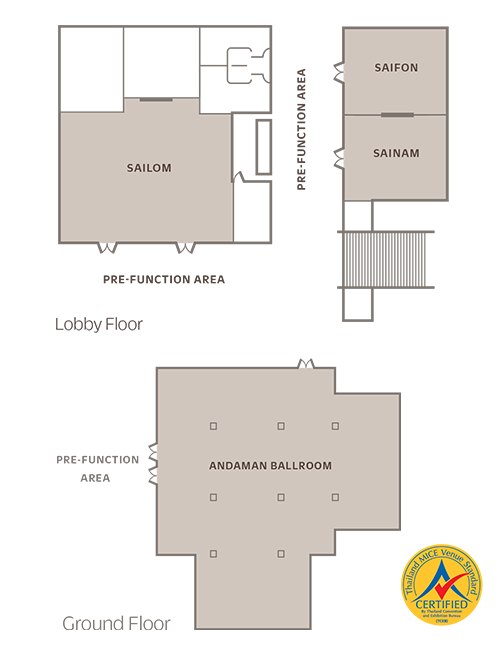 Similan Ballroom hosts 350 delegates in theatre seating. Talay Room hosts up to 36 delegates in classroom seating. Host incomparable meeting events at Laguna Phuket. Rewards program for group bookings. Outrigger Laguna Phuket Beach Resort's exceptional beachfront setting at Bangtao Bay is one of Phuket's most coveted addresses to host business meetings and social events. The grand Similan Ballroom and three meeting rooms provide flexible function space to comfortably host executive conferences of up to 350 delegates in theatre seating, and 290 guests for banquets. Outrigger Laguna Phuket Beach Resort is fully committed to MICE excellence with an experienced team who ensure careful attention to detail and flawless execution. Download the meetings brochure or click here to view the promotional video. Located on Bangtao Beach, the resort offer easy access to Phuket's main attractions. Patong beach and its large selection of entertainment and dining options are just 30 minutes drive while Phuket International Airport is just 30 minutes drive from the resort. The greater resort community of Laguna Phuket also offers an array of locations and amenities. The award-winning 18-hole Laguna Golf Club, over 30 restaurants and bars, and renowned spas. Travelling around the Laguna Phuket is easy, Laguna Phuket offers complimentary bus and ferry shuttles allow easy exploration. A variety of events are possible at the resort or in the surrounding area. Our extensive gardens and beachfront areas create inspiring settings for outdoor banquets and team building activities. Locavore: Showcasing Asian and European culinary styles, specializing in seasonal, locally-sourced ingredients. Breakfast buffet, a la carte lunches, and themed dinners. Edgewater: Modern beach side dining overlooking the swimming pool and Andaman Sea. Tailor-made sandwiches, pizzas, coffee, cold drinks and more. Metzo’s: Mediterranean restaurant for casual dining. Icon Terrace & Lounge: All-day terrace bar with live music and stunning view of the swimming pool and Andaman Sea. Tennis Centre with indoor and outdoor courts. Lessons available.